Douglas Fir is a conifer that grows natively throughout North America. This tall, evergreen fir tree is frequently used in the Christmas tree industry and has a lemonscented note that’s sweet and refreshing. doTERRA Douglas Fir essential oil is sustainably sourced from young trees in New Zealand, where it is a highly invasive species threatening the country’s ecosystem. By harvesting the young Douglas Fir trees and using them for essential oil, doTERRA is helping to combat the environmental impact of the trees overtaking the land while providing a premium conifer essential oil. 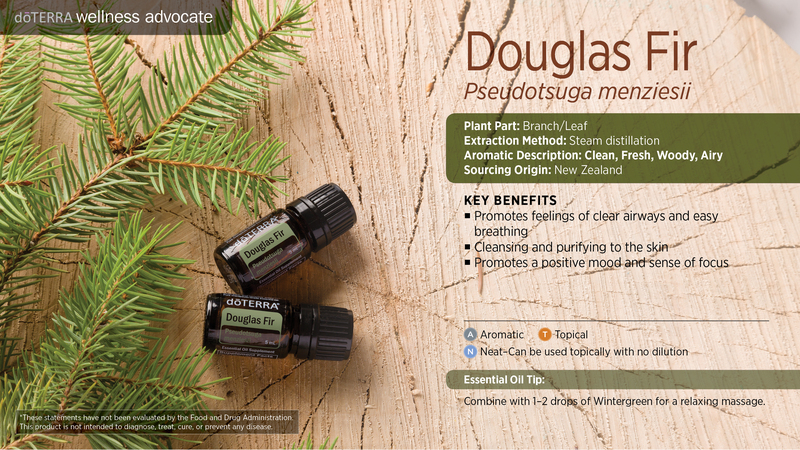 Douglas Fir has a unique chemical composition that’s particularly rich in beta-pinene, contributing to its ability to promote feelings of clear airways. Douglas Fir can also be used to purify the skin and promote a positive mood. Blending Douglas Fir with citrus oils will create an uplifting environment while freshening the air. Combine Douglas Fir with Wild Orange, Lemon, or Bergamot in a diffuser to freshen the air, uplift mood, and promote a sense of focus. Add 1 drop to facial cleanser, bar soap, or body wash for added cleansing benefits and an invigorating aroma. Diffuse 2–3 drops Douglas Fir with 2–3 drops Eucalyptus, or rub into hands and inhale deeply to promote feelings of clear airways and easy breathing. Combine with 1-2 drops of Wintergreen for a relaxing massage experience.